The genus Trillium includes approximately 35 species in eastern North America. One of the showiest and most easily recognizable of these is the large-flowered or white trillium. Trillium, so named for its floral parts in threes (from the Latin trilix, meaning triple), also occurs in western North America (seven species), and eastern Asia (six species). Considered by most botanists to be a member of the lily family (some assign it to its own family, the Trilliaceae), the genus Trillium is unusual among the monocots in that its leaves are net-, rather than parallel-veined. 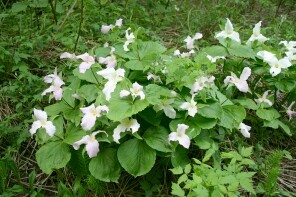 Two subgenera are recognized: subgenus Trillium, the pedicellate trilliums, and subgenus Phyllantherum, the sessile trilliums. Trillium grandiflorum is pedicellate, that is, flowers are borne on a pedicel, a stalk above the leaves. Morphology: The solitary flower is 2-3" wide, with 3 large, white petals. Petal bases are erect, then flaring to produce a showy flower that becomes pinkish with age, the brilliant white color changing to dull pinkish-purple before fading. The flower is subtended by 3 green sepals; each flower has six stamens with yellow anthers. The three leaves are each 2-6" long, broadly ovate and pointed at the tip. Leaves are green, occasionally with maroon overtones when first emerging, later turning to a rich green. They may turn purplish or maroon before senescing. Trillium grandiflorum fruit is a pale green berry that falls from the plant when mature. Seeds are dispersed by ants, which are attracted to the lipid-containing elaisome. 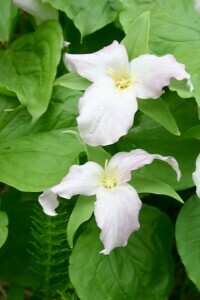 Habitat: Trillium grandiflorum occurs in rich well-drained soils in deciduous or mixed woods, particularly those dominated by sugar maple, white ash and basswood. They do best on a base-rich site. Scores of individuals may cover a sweeping expanse of the forest floor. According to Trillium experts Frederick and Roberta Case, the most vigorous populations are found in "young to early maturity stages of second-growth forest, declining with shading in old-growth." Life history: Trillium grandiflorum is a long-lived herbaceous perennial; an individual plant may live for more than 3 decades in the forest understory. Leafy and flowering shoots arise from the underground rhizome of mature plants and flower in the early spring before the tree canopy leafs out. Fruit forms within weeks of flowering; the leaves persist until mid- to late summer. Seeds exhibit double-dormancy and the single lanceolate cotyledon usually appears above ground the second spring after dispersal. For the next few years, a single, heart-shaped leaf appears. The familiar, three-leaved form follows, and an additional three or four years may pass before flowering. When enough energy has been stored in the growing rhizome, the individual plant will produce a flower. Distribution: Trillium grandiflorum is the provincial flower of Ontario, Canada and occurs in 28 of the lower 48 United States. The species is found in Maine, New Hampshire and southern Quebec, across southern Ontario to Michigan, Wisconsin, and northeastern Minnesota and south to Georgia. Protected Species Status: In New York state Trillium grandiflorum is considered to be "exploitably vulnerable." If populations of the species continue to be reduced by factors such as habitat loss, animal browsing, or over-collecting, the species may become "threatened." White-tailed deer browsing definitely negatively impacts populations of Trillium grandiflorum, but it has also been shown that deer are long distance dispersers of Trillium seeds.